When my rust-addled co-worker David Tracy described the trip he wanted to take with me, he said there was a guy in Virginia who had “a few Honda Beats.” The inadequacy of this description is like saying that Pol Pot “wasn’t a great boss,” or that having your leg mangled in an escalator “stings.” What we found when we got to that Honda dealership in Christiansburg, VA was so far beyond what I was expecting that it still hardly seems real. Christiansburg, VA is a town of about 20,000 people, and even if you spent all day walking around the town, I don’t think your take-away from the town would be “Hey, I bet this place has one of the largest collections of JDM cars in America and all sorts of other delightful automotive treasures.” But you’d be wrong. So very, wonderfully wrong. That’s because Christiansburg, VA is also the home of a Honda dealership owned by Gary Duncan, and Gary Duncan has quietly but obsessively assembled one of the most remarkable car collections I’ve ever seen. Before we get into the collection, let’s talk a little bit about the man behind it. Gary Duncan has been around cars all his life, and selling them since he was 19. 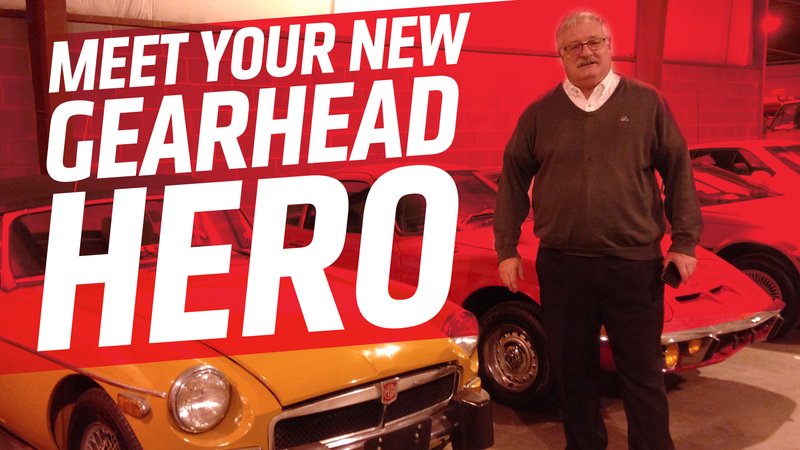 He’s had a Honda dealership for many years, and in the 1980s won a trip to Japan. I get the impression that that trip was an important, life-changing moment, because that trip seems to have sparked within him a passionate love for Japanese cars, especially Kei cars, utility vehicles, and rare and unusual cars. That’s not to say Gary is laser focused on just one thing, even if the man clearly has his passions and fetishes. His collection is wonderful in its incredible diversity, and the ability he has to see the novelty and value in even the most humble of cars. The collection is absolutely one after my own heart, and I got the impression from talking to Gary that he does this because he genuinely loves these cars. This is not a collection about status, or some way to telegraph wealth – it’s one person’s automotive passion, realized. He seemed genuinely surprised and delighted at David and my enthusiastic reaction to the collection – you get the impression that he’s not entirely sure if people will just think him mad. Even better, he actively wants to share his collection with interested people – if you go to his website, you can arrange to see the collection, for free. He’s just happy for people who love these cars to come and appreciate them. While there, we shot some videos, which I’m embedding here, but thanks to the fact that we didn’t know what to expect and the level of excitement we could barely contain, I know they’re not great videos. We’ll be back, to explore in more detail, but until then, let me try and share with you what this place is like. Change out of your good pants and follow me! ... big American land yachts. And other classic American iron. When was the last time you saw a Chevy Luv that wasn’t 620% rust? The answer is never, until now. And the amazing Row of AMCs, including a rare 5-liter Gremlin X.
I remember these Matadors, because as a kid, I used to sit right there, in front of the headlight and indicator, on the bumper. It made a perfect little seat. This next room here, this may be the most important part of the collection, because it’s a window into the glorious madness of the Duncan Collection. Are you familiar with the charming little Nissan Figaro? There’s over 100 Figaros here. There’s nowhere else in the world with this many Nissan Figaros in one place. Being in this room makes you feel like maybe Elon Musk is right, maybe the universe actually is a simulation, and you’ve just stumbled into a place where it’s glitching out. Someone replaced the variable that reads ParkedCar=(RND Car (Region1/TimePeriod1)Car) with a constant that reads ParkedCar=(NissanFigaro). You feel like you’re going insane, but part of you is happy that it’s finally happened. It’s confusing and wonderful all at the same time. Gary Duncan explained his Figaro obsession pretty simply to me: he was at the 1989 Tokyo Auto Show when Nissan unveiled the Figaro. He was smitten, and asked the Nissan reps when he could get one. He was told, sorry, never is when, because these are not going to be sold in America. I guess he showed them. Holy hell. And we haven’t even gotten to the astounding Japanese Funerary cars, which you’ll need, since by now you’re dead. There’s three of them. If you ever wanted to know what it would be like to take a bunch of pills and go camping with Siouxsie Sioux, this should give you a pretty good idea. Type II Volkswagen buses, campers, and this amazing pick-up, complete with canvas cargo cover. Inside, I ache. ... a Renault Alpine. Holy crap, Mr.Duncan, whatever your point is, you’ve made it! I give up. You win. These Beetles! Here’s what’s interesting about them: most here are late-’70s fuel-injected Beetles and Super Beetles, not usually the most collectible, but some of these have as few as 6 or so miles on them! They were never sold– these are effectively new showroom-floor Beetles, transposed in time. Seeing, touching, smelling these cars was like being teleported back to 1977, thrilled to buy your first new car, a Beetle. It’s amazing. One of these Corvettes is a dead ringer for the one Duncan destroyed when he was 16. Want to take a breather? Reflect on all of this? Go ahead, because we haven’t even been outside yet. Off-road Delica adventure vans, full of plush carpet and curtains and badassery. Even more Centuries, because of course there are. I forgot to mention the huge collection of Japanese fire trucks. Which is a shame, because there’s so many and they’re fascinating. And huge. Except when they’re tiny. I adore these Daihatsu open-deck vans. They satisfy my packaging and space-utilization fetishes like some wonderful, illegal drug. And this guy has like a dozen of them. Why print a brochure when you can just put everything right on the car? Look, there’s more – lots, lots more, but I can’t go on. I’m spent. This collection will wreck you, in the best possible way. The fact that it’s both relatively unknown and has grown by several hundred cars in the last year alone, and shows no sign of slowing has to make this a goal for anyone who loves cars. Gary Duncan is happy to have you visit. Some of the cars are even for sale. He – and Carson, the incredibly knowledgeable guy who took us around – are delighted to have people come by, and I can’t recommend it enough. As far as I’m concerned, Gary Duncan is a hero of automotive preservation and evangelism. He has wonderful, eclectic tastes, an incredible collection, and is one of the nicest people I’ve ever encountered. Gearheads, listen to me: if you can make your way out to Virginia, pay this place a visit. It’s good for your oily soul. Here’s Everything You Need To Know About Shipping A Car To The U.S.